Elected Honorary Member of the ADA! 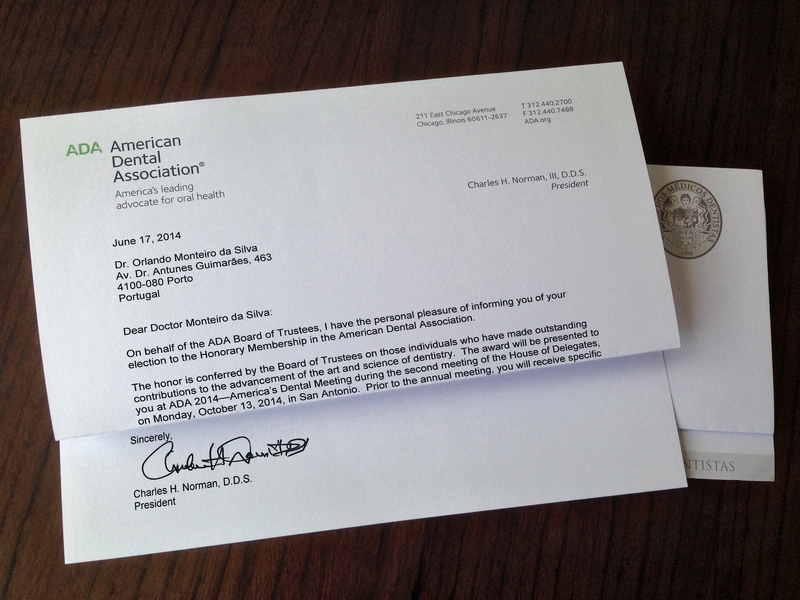 Charles H. Norman III, ADA President wrote to me on behalf of the ADA Board of Trustees informing me of my election to the Honorary membership in the American Dental Association! …”The honor is conferred by the Board of Trustees on those individuals who made outstanding contributions to the advancement of the art and science of dentistry”…. This honorary Membership is a tremendous joy for me. The ADA and its efforts in promoting oral health in the United States and at global level have always been a source of inspiration for me. I remember very well in the beginning of the past decade, applying for ADA Affiliate membership. Besides being part of the ADA organization, the possibility of accessing the most valuable information in terms of oral health promotion was of tremendous importance for me not only as a dentist in the private practice, but also for the professional organizations in which I was involved. The ADA, being on the frontline of the defence of dentists and the profession in the US, constituted many times a source of inspiration to launch similar battles in Portugal , at an European Union level and later on at an FDI level. I could never have imagined at the time, that one day I would be distinguished with such an honour! This election by the ADA, one of the biggest, oldest and most respected professional organizations of the world is an enormous incentive to continue the fight to help promoting access of the populations to oral health! You are currently browsing the Orlando Monteiro da Silva blog archives for July, 2014.